Araka la Kana and the anthology of Juan Carlos Aragón, fill the CERE in the first pre-carnival act 2018. Approximately 1,000 people attended the first act of the churrigo pre-carnival organized by the Peña Los Cansaliebres. 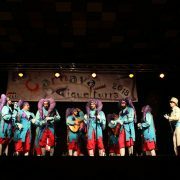 From 9 o’clock at night, Araka la Kana and the Anthology of Juan Carlos Aragón, began their musical performance giving a review of the pasodobles, coplillas and popurris with those who conquered the Carnival of Cádiz in 2007, winning the first prize. 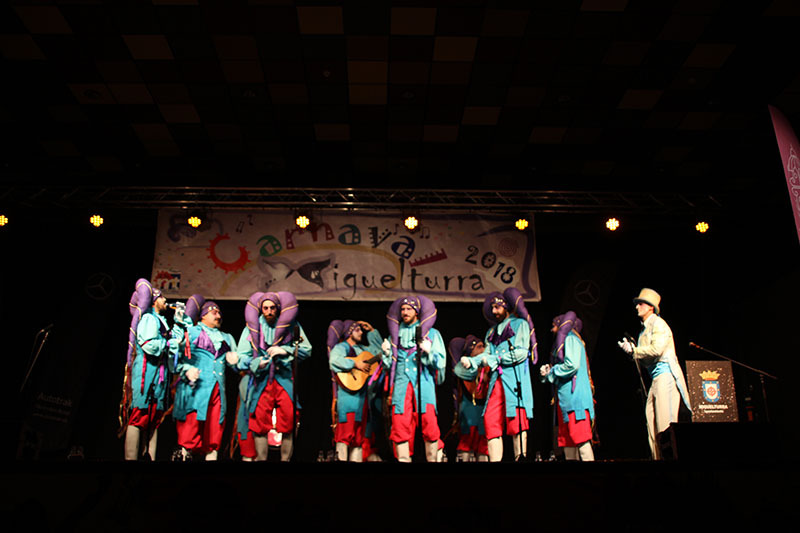 The second part of the performance, was dedicated to the anthology of Juan Carlos Aragón, one of the most awarded composers in the Cadiz COAC, in 1999 he won his first prize with the chirigota The Yesterdays, in 2002 with the Fallen Angels Troupe, in 2007 with the comparsa Araka la Kana and in 2015 with the comparsa The Millionaires, also has a second place with The Condemned in 2001, a third prize with the Band of Captain Veneno in 2008, five fourth places in 1996 with the Guiris , in 2000 with Flamenkito Apaleao, in 2001 with Los Panteras, in 2003 with the Americans, in 2006 with the Parias and two fifth place, in 2002 with Vota PICHA (independent party of the kids of Aski) and 2005 with the Gulf of Cádiz. During the break, the monologist Chema Trujillo, we delight with a review of local news, getting the public standing with his wit and good humor throughout his performance. The event was attended by the councilman of celebrations, Diego Rodríguez, councilor for culture, Fátima Mondejar, which will be major masks of 2018, Orestes Corral and Mª del Carmen León, the major masks of 2017, José Cañizares and Antonia Nieto, as well as the from other years, the President of the Miguelturra Carnival Association, Raúl Domínguez, King of Carnival, Serafín Delgado, President of the Peña los Cansaliebres, Alberto Soria, who handed over at the end of the ceremony a Carnival Commemorative Mask of Miguelturra 2018. Good start of the carnival acts of 2018. Congratulations Cansaliebres.